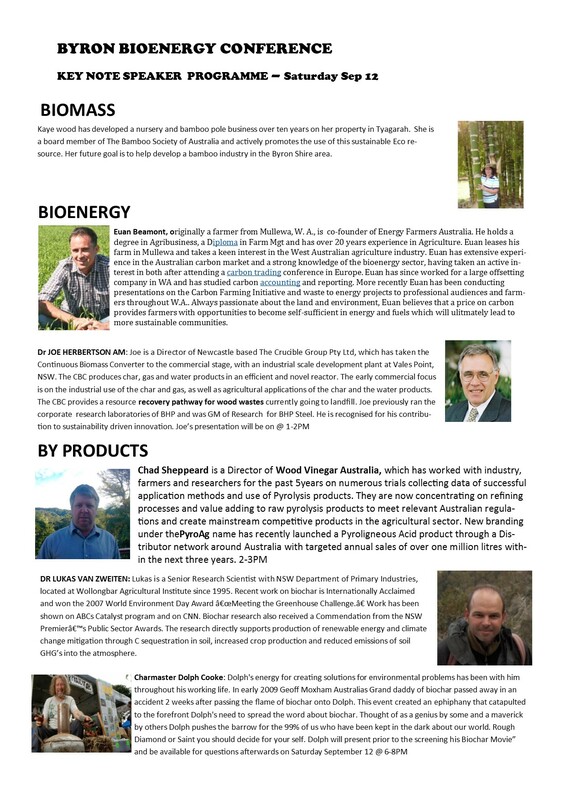 Byron Bay Bioenergy Conference will cover topics on Biomass, Bioenergy and By-Products. The Conference aims to introduce Property Owners, Farmers, Councils and other Industries with Biomass to be thermally recovered via the Bioenergy Process. This is for better Financial, Environmental and Social outcomes. There will be a focus on the Carbonization of Biomass which relates to Charcoal/Biochar Production. 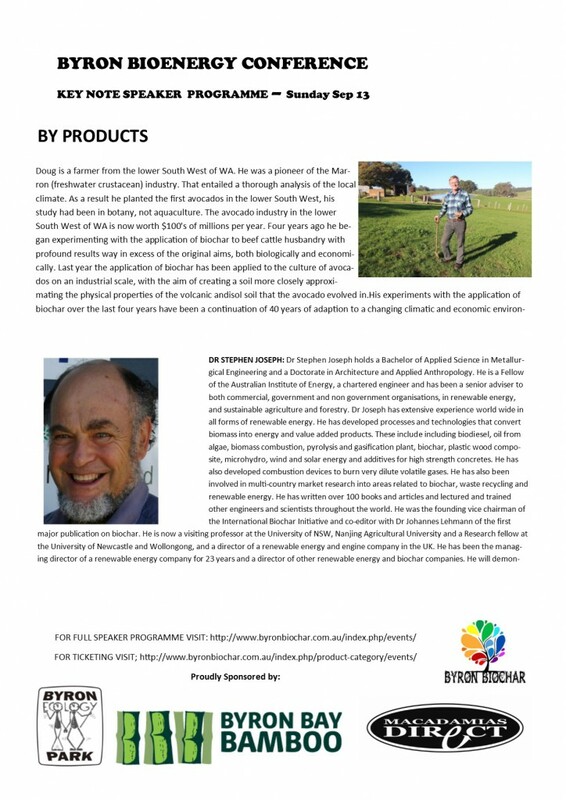 The Conference will include Key Note Speakers, Biochar Demonstrations, a World Premier Screening of “The Biochar Movie” by Biochar Project Australia , Trade Exhibits and Food Stalls. Parking will be available onsite. Kaye Wood – Byron Bay Bamboo 10:30 – 11:30 AM. Lunch – 11:30 – 12 Noon. Bob Doyle – Hemp International Australia 12 Noon – 1PM. Dr Joe Herbertson – The Crucible Group 1-2 PM. Chad Sheppeard – PyroAg Wood Vinegar 2-3PM. Dr Lukas Van Zweiten – NSW DPI 3:20-4:20PM. Early Supper Break – 4:20 – 6PM. Evening Film Feature 6PM – 8PM Including Short Intro and Q & A after. ‘The Biochar Movie’ Featuring Dolph & Gillian Cooke, Biochar Project Australia. Saturday, September 12, 2015 – 10:00am to 8:00pm. Byron Eco Park, Old Brunswick Rd (Off Grays Lane) Tyagarah. Read about Byron Bay bioenergy conference at the Greens website. Previous post: New use for biochar – Biochar as a security device.